A steady rain fell. Hikers from next door encouraged us to come to their group site which had a large, partial stone and wood enclosure. Other hikers soon joined us. Tony and I ate our Mountain House Breakfast Skillet dehydrated meal and felt the hot food warm us on the inside. 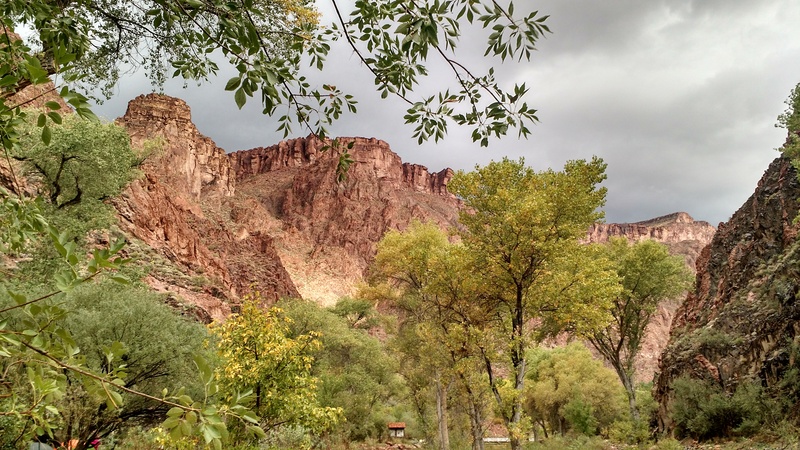 Standing in the chill with the thunder echoing throughout the canyon was beautiful. The gray rain fell in sheets. 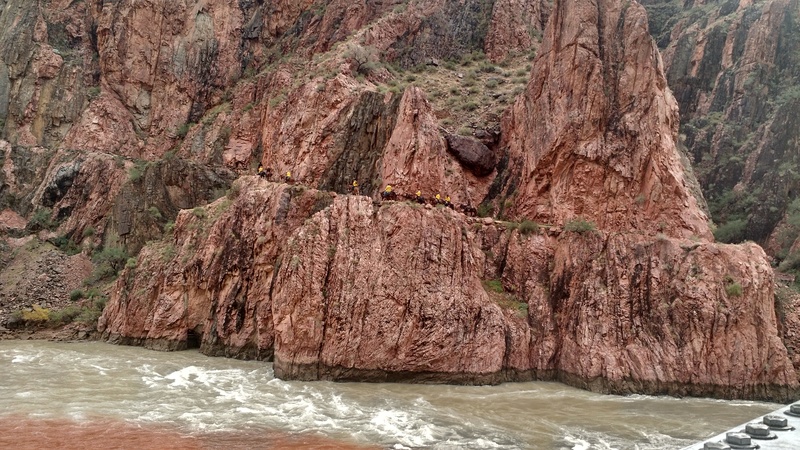 The rocky canyon walls glistened. Lightening flashed. 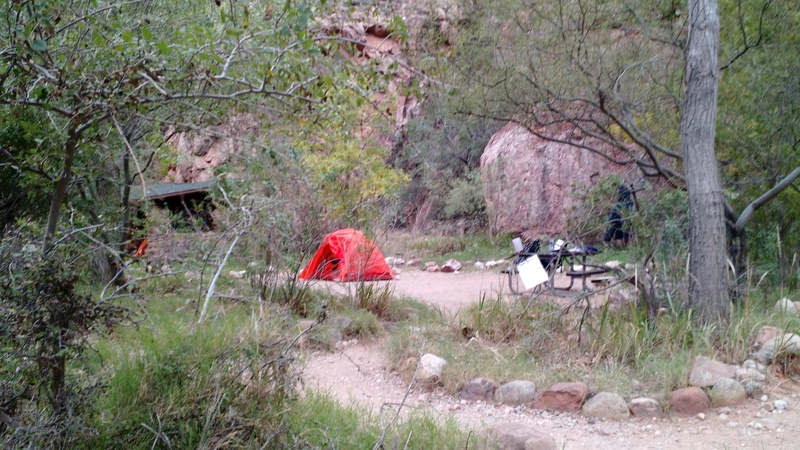 The chill of the wet air and the crowded enclosure persuaded us to return to our tent. Standing all day unable to do anything was not a fun proposition. Talking to people we did not know was interesting. Hikers in their element are the friendliest and kindest people versus their city counter parts. 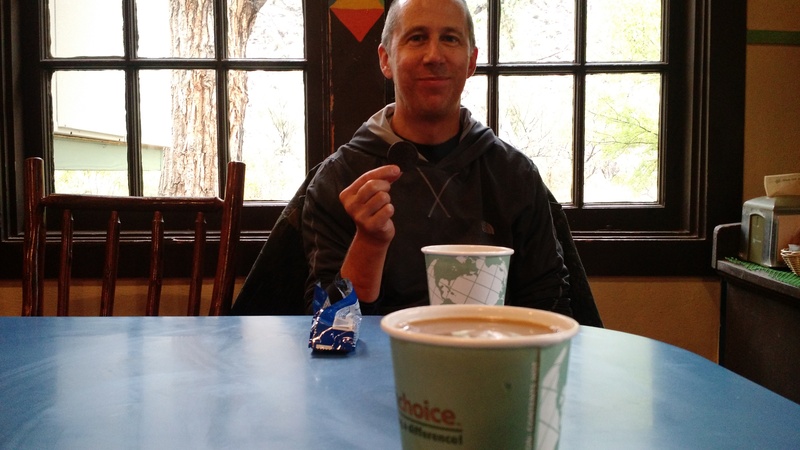 The rain did eventually stop while we sipped hot coffee at the Canteena at Phantom Ranch. Water dripped off of the leaves and eaves and the Bright Angel Creek roared, stirring up brown muck from the rising flood waters of higher elevations. Our muscles still ached and even a slight hill caused both of us to groan. 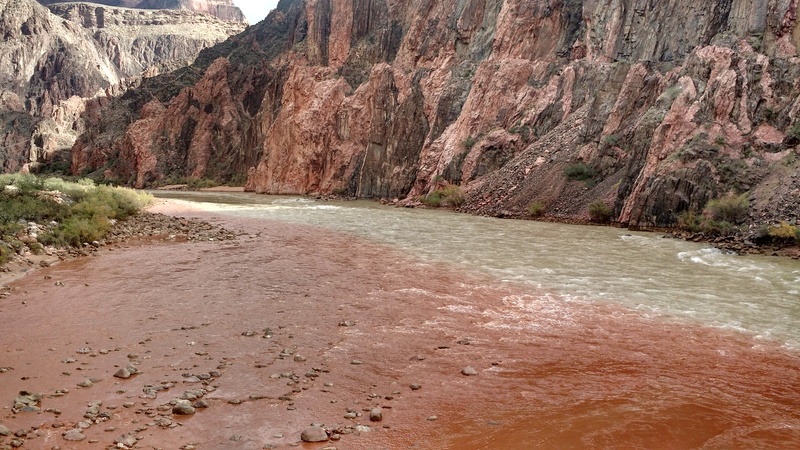 We decided to walk and explore a place we have never seen—the Colorado River. Two bridges cross the river—the Black and Silver bridge. 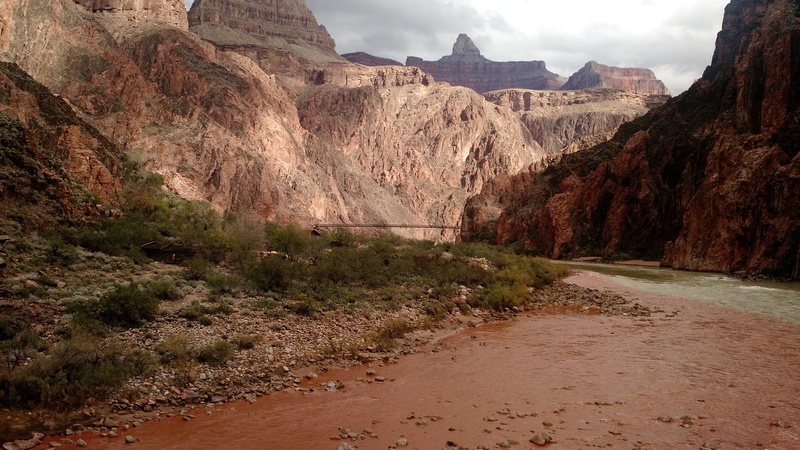 We walked the Bright Angel Trail, climbed over the rivers rocky shores til we sat on its banks. 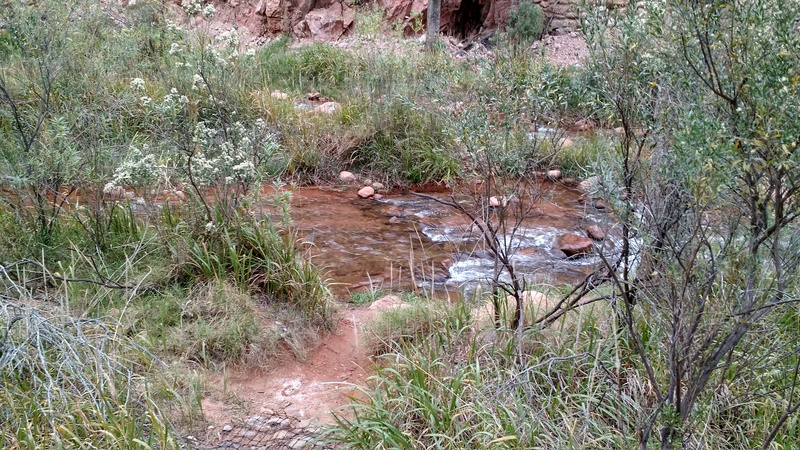 The river is a beautiful sea green with strips of red-brown when the sun illuminates it. 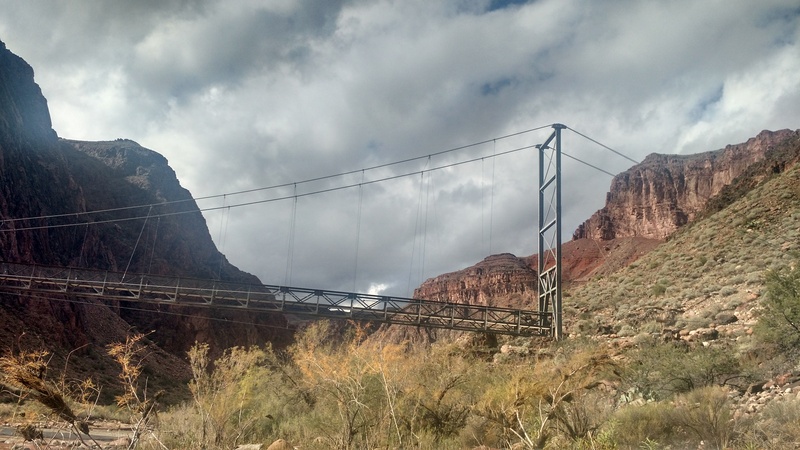 The bright Angel Trail crosses the Silver bridge while the Kaibab Trail crosses the Black bridge. When you walk the Silver bridge there are grates, and you feel the sway of the bridge and see the deadly beauty of the rivers powerful current far beneath your feet. You feel both secure and in danger at the same time. Life shouldn’t be lived in fear. 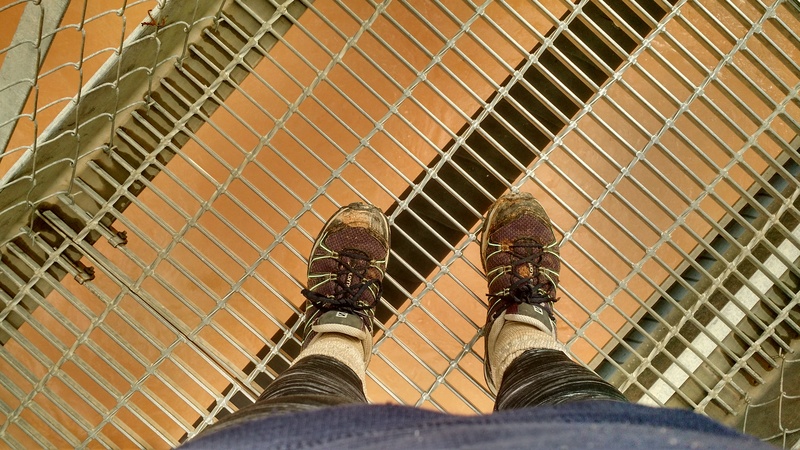 Even standing on the Silver bridge, I forced myself to look down and face my fears. It takes a lot of effort to get here and moments you think reaching that goal is impossible. We are here, and I am so thankful. It is now late afternoon. 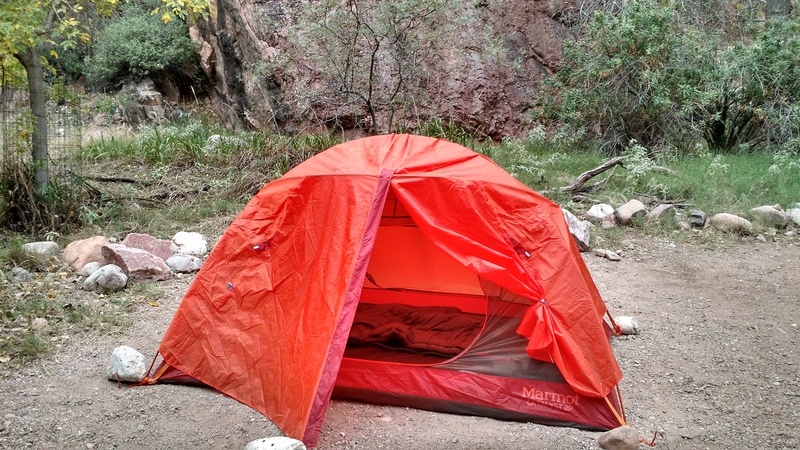 The rain comes in short spurts as I lay in the tent. I love how it spatters in symphony with the roar of the creek. There is no cell signal and my phone can’t access the internet. I have been out of contact with the rest of the world since Sunday morning. Being out of contact and unplugged is wonderful. There is a danger of becoming jaded in the online world so much so that you can become ineffective. You must take moments to be out of contact and refuel. You don’t give the benefit of the doubt. When someone shares something, you judge it as narcissistic. You are short on patience. A loss of creativity and social blindness. The online world is just as real and fraught with dangers as the face-to-face world. To live fully as a Christian, we need to balance these worlds.